The share of online sales on thetotal physical books is 18.0% higher than the same quarter a year ago. 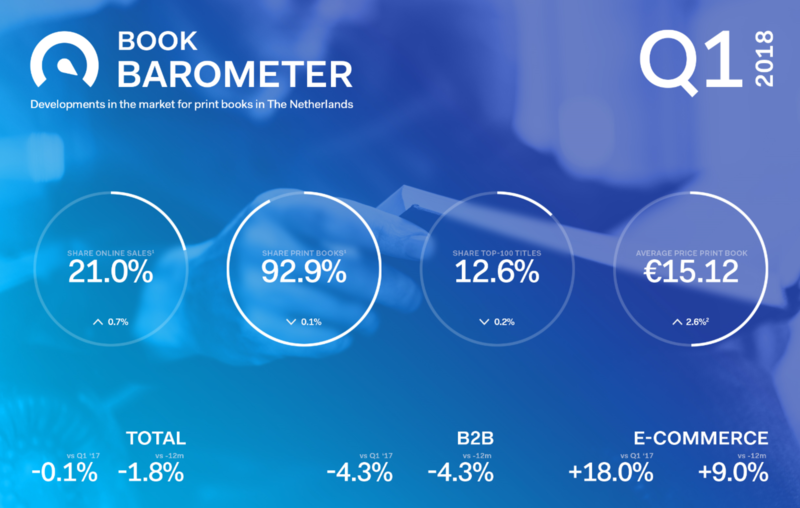 The total sales of the physical book fell slightly by -1.8% compared to a year ago. The development in the field of Printing on Demand shows the same picture as last quarter; an upward trend in sales and number of titles. The book barometer has a new chart for sales for bookstore and online per genre. The new chart 'sales in channels per genre' shows that subscriptions are particularly successful in fiction and children's books. The library has the most loans in the field of travel, romance, children and educational. The best selling genres are especially thrillers, management and people and development. Loans from e-books rose 18.0% compared to the same quarter last year and 18.7% higher than the previous 12 months. 7.1% of all sales is an e-book. This is a slight increase compared to the previous quarter (+ 0.1%).